We can help you with custom sheet metal shop fabrication. 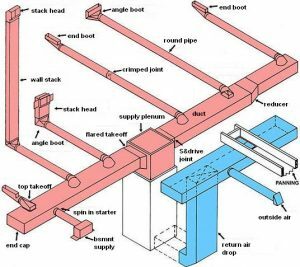 We repair, design, build and install air distribution systems, custom ductwork transitions, custom rectangular ductwork, custom supply and return plenums. We also install spiral ductwork and may other types of sheet metal ductwork. We can repair, design and install sheet metal or flex ductwork air distribution systems for residential and commercial projects, remodels, retro fit and tenant improvements.